NEW! Stop by the Mandarin Festival or the Farmers’ Market to try our new artisan product – Mandarin Pepper Fruit Spread. 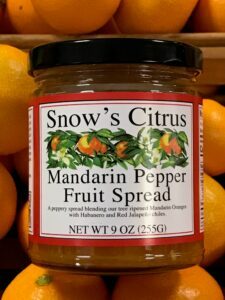 Our tree ripened mandarins blended with habanero and red jalapeno peppers. The sweetness of our citrus combines with a spicy kick of flavor!